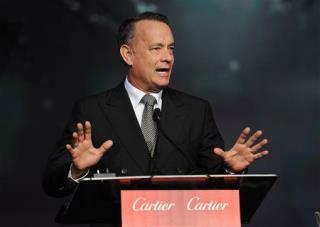 (Newser) – Tom Hanks: beloved actor, slam poet, space enthusiast, and ... iPad app developer. And not just any developer, but developer of the most popular iPad app of the moment, Time reports. As of this writing, the Hanx Writer app, launched Thursday, sits in the No. 1 spot among free apps on the iPad App Store. Developed by the actor, the app simply allows your iPad to mimic various kinds of old-fashioned typewriters, complete with clicking keys and dings when you move to a new line. The ding at the end of the line was kinda cool, but everything else about typing was pretty awful. As far as I'm concerned, the good old days in general really weren't that great. Maybe future enhancements could include virtual "White Out" or correction tabs. We didn't get to use any of them in typing class at Putnam City. The old IBM Selectric hummed away and you could not use any correction. Then mom got me an electric typewriter that had a special ribbon where the top was black and bottom was correction. You flipped a switch to choose. You could also use a black/red ribbon in it. Then I was the first one in high school with a laptop. Well, it was a Radio Shack 286. I took it to the library to make notes. I was the first one to turn in a paper printed on a computer printer. The school then created a policy allowing it. Then at college, i had upgraded to a Zenith 386 laptop. I would get interesting looks as I also made notes with it at the library, thus keeping me from having to check out books. When I went back to college for my second degree in 1999, our papers were not even printed as they were submitted to Blackboard. Then I took a class where the textbooks were all online. I did have one class in particular where the instructor did the book adoption for a special out of print book. Idiots not taking the class saw it on the shelves at the campus bookstore and picked it up even though they were not taking the class. Some of us didn't get books at all. Each of us had to teach a chapter from that book. Strangely enough, i found my whole chapter at Google Library that they had scanned from a library copy. If he actually wrote this app totally himself, I'm impressed. If he is simply the face in front of the app, not so much.